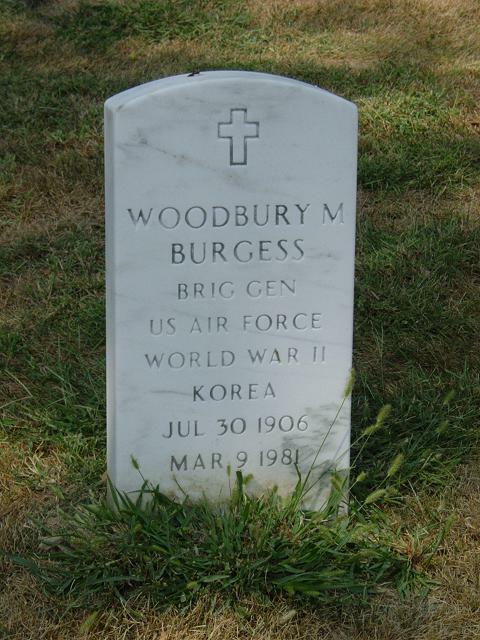 Woodbury Megrew Burgess was born in Newton, Masschusetts, in 1905. He graduated from Staunton Military Academy, Va., in 1923, and from the U.S. Military Academy June l4, 1927, and was commissioned a Second Lieutenant of Cavalry. Assigned to the 14th Cavalry at Fort Sheridan, Illinois, in September 1930, General Burgess entered the Cavalry School at Fort Riley, Kansas, and graduated from the troop officers course in June 1932. Going to Fort Stotsenburg, Philippine Islands, he served with the 26th Cavalry. Appointed a mathematics instructor at the U.S. Military Academy in June 1935, four years later was assigned to the Fifth Cavalry at Fort Bliss, Texas. Transferred to Air Corps headquarters in November 1941, General Burgess was executive of the Operations Section, Office of the Assistant Chief of Air Staff for Intelligence. The following March he was appointed chief of the Informational Intelligence Division in that office, and in July 1942 he was designated deputy assistant chief of air staff for intelligence. The following March General Burgess was named deputy chief of staff for administration of the 20th Bomber Command in the Asiatic Pacific Theater, and that July he joined the Far East Air Forces in that capacity. Transferred to the Pacific Air Command in December 1945, he was assistant chief of staff for intelligence. Joining the Far East Command in January 1947, he served as deputy chief of the Air Division, Joint Strategic Plans and Operations Group, and on April 2, 1947, he was transferred to the Air Force. That August General Burgess became assistant director of the Intelligence Division, Armed Forces Staff College, at Norfolk, Virginia, and in February 1949 he was named director. Reassigned to Air Force headquarters in August 1950, he was deputy chief of the Evaluation Division in the Office of the Deputy Chief of Staff for Operations, and the following February he was named chief of the Policy Division. Joining the Air Defense Command at Ent Air Force Base, Colorado, in November 1951, General Burgess was deputy for intelligence, assuming additional duty as deputy chief of staff for intelligence of the Continental Air Defense Command on September 1, 1954. Returning to Washington, D.C., on August 15, 1955, he was named deputy director for production of the National Security Agency. His decorations include the Legion of Merit, Bronze Star Medal and the Most Excellent Order of the British Empire. He is rated as an aircraft observer.